Up late tonight and looking for a group to ride with? If you are in or near Chicago, join the L.A.T.E. Ride! There’s “On-Site Registration” for the L.A.T.E. 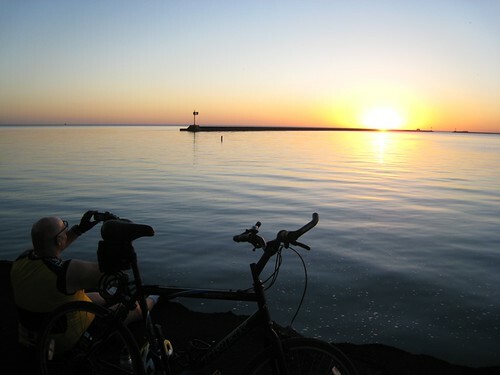 Ride at Buckingham Fountain tonight. 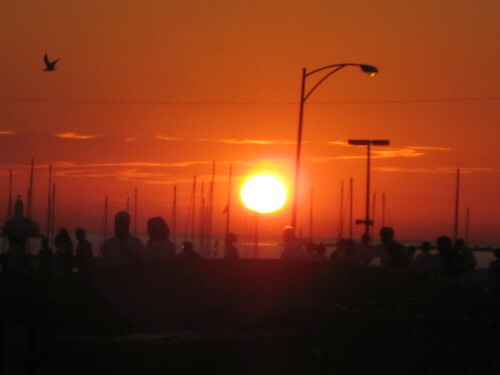 We take registrations on-site between 10:30pm and 12:45am at Buckingham Fountain. Cost is $45 per person. No free t-shirt for those who register on-site. T-shirts may be purchased for $5.00 while supplies last. Go straight to the On-Site Registration tent to sign up in person. Everything you need to know about the L.A.T.E. Ride is on the FAQ page – answers to all your logistical questions – where to go, what to wear and bring, and night-of schedule. All proceeds from the L.A.T.E. 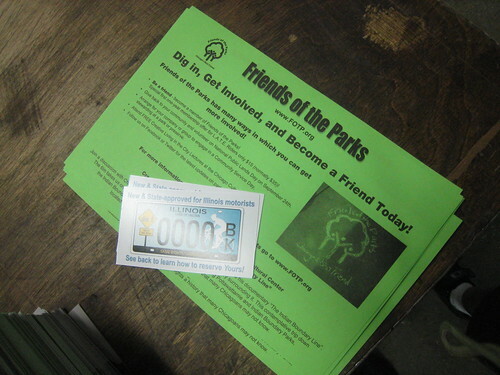 Ride benefit Friends’ of the Parks. This weekend the annual L.A.T.E. 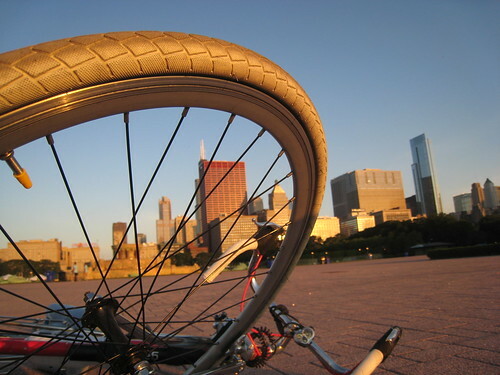 Ride in Chicago will cycle through Chicago neighborhoods as a fundraiser for the organization Friends of the Parks. Last year, the ride celebrated its 21st year. 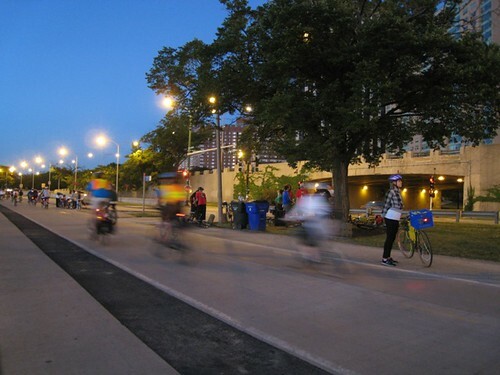 It’s a great way to see the city all lit up – and maybe venture off your typical bike commuting route. This year the L.A.T.E. Ride will have a new route – highlights include the South Loop, Chinatown, Greek Town, Chicago’s historic “Emerald Necklace” and much more! Night-of registrations will be accepted. New this year – we begin riding at 12 midnight! 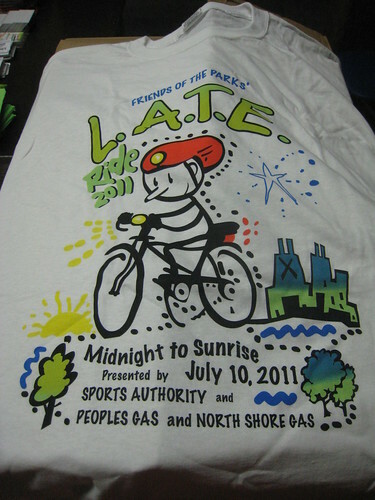 10:00pm – Midnight: Night-of-Event Packet Pick-Up and On-Site Registration, helmet sales and bike repairs by Village Cycle Center, plus live music by Four Man Band. 11:00pm: Head for the stage for our annual BEST LIT BIKE and BEST DECORATED HELMET contests. Prizes will be awarded. Be creative! 11:50pm: Look for your color group (Blue, Green, Red, Orange, Yellow) along Columbus Drive. Listen for instructions. 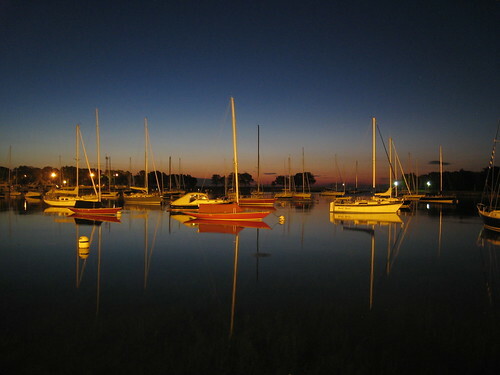 Also new – while you wait for the sun to rise over Lake Michigan enjoy an all-you-can-eat optional breakfast from Goose Island – Cost is only $7.00 per person, $2.00 of which benefits Friends of the Parks. McDonald’s L.A.T.E. Ride turns 21 this year! 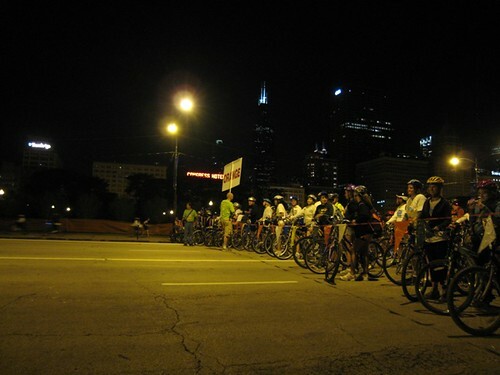 If you’re in or around Chicago, I hope you can join 9,000 bicyclists for Chicago’s BIGGEST after-midnight ride! 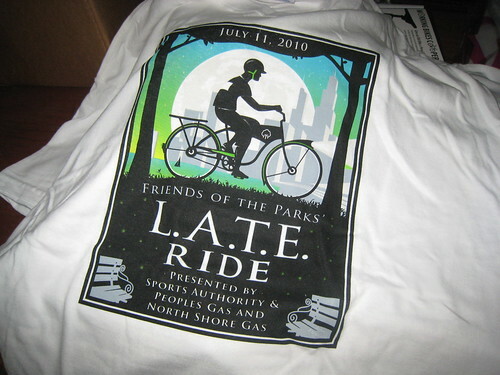 Register online until noon on Friday, July 10, OR in person the night of the ride. For the most up to date information and volunteer opportunities, visit www.lateride.org. Hope to see you there!